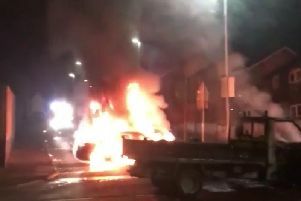 Police investigating a suspicious fire at commercial premises in Church Square, Banbridge early this morning have appealed for witnesses to come forward. Police received a report at approximately 4.10am on Tuesday, July 18, that a fast food outlet was on fire. Firefighters at the scene of the early morning blaze in Church Square. Crews of firefighters were tasked to the scene, but the property was gutted by the blaze. This was the second suspected arson attack at Pizza di Napoli this month. The first floor flat above the business premises was extensively damaged in a fire on July 5. Sergeant Steven Weatherald said: “I would appeal to anyone who may have noticed anyone acting suspiciously in the area to contact Police at Banbridge on the non-emergency number 101, quoting reference 146 18/07/17. Police are investigating the suspected arson attack on the take-away business at Church Square. The Pizza di Napoli take-away business was completely gutted by the blaze.